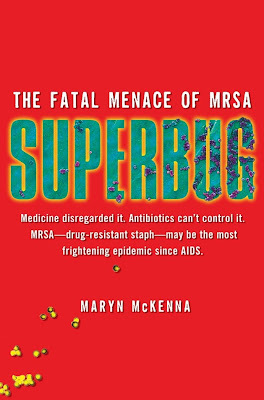 Superbug: SUPERBUG's cover - a sneak peek! Constant readers, apologies for disappearing unexpectedly. It's been a challenging few weeks at Casa Superbug, with a death in the family and a sudden trip to a part of the country with, hmm, low connectivity. But I'm back. And there's so much to talk about. Here's the first in a long list: The cover art for SUPERBUG! My editor says it will be even more gorgeous in real life: There are glossy areas, and embossed areas, and color that will fly off the bookstore shelf, smack you in the eye and insist on being carried to the cashier. More to come soon, on the many stories that occurred last week, and an exciting paper in a medical journal later this week.